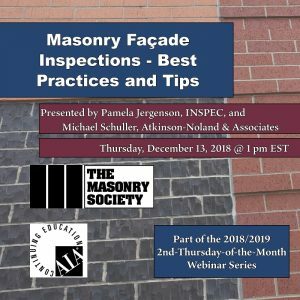 The Masonry Society’s 2nd-Thursday-of-the-Month Webinar Series continues on December 13th at 1 PM ET with Masonry Facade Inspections – Best Practices and Tips. Masonry façade inspections are critical to maintaining building enclosure performance and integrity. A façade that is not inspected and maintained can lead to expensive repairs, or more importantly, to life-threatening unsafe conditions. Discover the best practices in masonry façade inspections from Pamela Jergenson, CCS, CCCA, BECxP, CxA+BE, Senior Building Enclosure Consultant at Inspec and Michael Schuller, PE, FTMS, President of Atkinson-Noland & Associates Consulting Engineers. They will discuss The Masonry Society’s Guideline for Masonry Façade Condition Assessment,and give examples of how to conduct a façade inspection on an existing building with photos of actual conditions in the field. Learn about how to incorporate investigative techniques into a façade inspection to help guide your diagnosis of façade distress and obtain critical information for designing repairs. Future topics and speakers are shown below. Each webinar will provide 1 hour of AIA Learning Units and most qualify as HSW LUs.